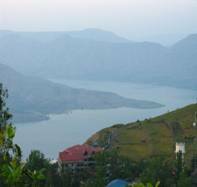 Panchgani is a quite essential residential hill station. It can be seen in the architecture of the old British buildings, the Parsi houses and the boarding schools that have been around for a century or more.Panchgani derives its name from five hills around it and is situated at an altitude of 1334m, it is just38m.below Mahabaleshwar.These 38m.translate themselves into a breathtaking 18km.approach, that swoops around bends with abandon, offering heart stopping views of the River Krishna on one side and the coastal plains on the other side. The drive between the two towns is breathtaking. Famous for its flowers like Buttercups, pimpernel etc., during the months of August-September, sights on the hill slopes of this place are spell bounding.Panchgani is one of the rare places that does not crowd anyone, yet in its own unhurried way deeply touches every visitor. 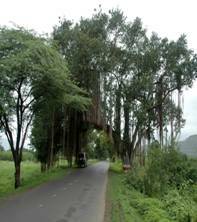 It is situated in the Western Ghat and is easily accessible from Mumbai and Pune. This is a flat mountain peak where you can feast your eyeson the coastal plains, looking like a miniature water colours.Table land is situated around 60 mts high and it is the second longest mountain plateau in asia with flat large expanse of laterite rock. There are folkores and myths which say that the Devil's Kitchen got its name for it is believed that the Pandavas stayed here for a while and used this place to cook their food. It is situated to the south of tableland and visited by number of tourists. 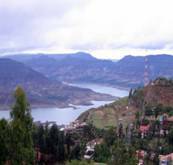 Wai, located at the banks of Krishna River, is a pristine city nearby Panchgani. Wai is blessed with imposing seven Ghats known as Gangapuri, Madhi Aali, Ganpati Aali, Dharmapuri, Brahmanshahi, Ramdoh and Bhimkund. Dhom Dam is a water spot situated at a distance of about 21 kms away from Panchgani which is of major tourist’s attraction. This place entertains the tourists with scooter boats and Speed boats which is a thrilling experience along with the feast of the beautiful natural surrounding. This point is situated on a small hillock facing the Krishna Valley .From here one can see the glittering waters of the Dhom Dam and Pandavgad and Mandhardeo are also easily seen. 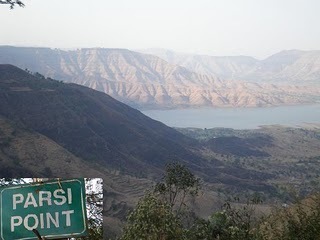 Parsi Point is supposed to be very windy and is situated on the way to Mahableshwar overlooks the Krishna valley and the blue mirror like waters of the Dhom Dam. 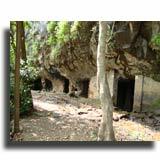 The Rajpuri Caves in Panchgani is a religiously important tourist spot. These ancient caves are surrounded by many water kunds (ponds). Devotees believe that taking bath in these holy kunds will provide relief from all kinds of diseases and evils. Legends claim that the holy Ganges also flows into these kunds. The Wednesday market or Budh-Ka-Bazaar is one of the busiest parts of shopping in Panchgani where you can shop for souvenirs. This place is also famous for jams and marmalades and you can shop it in Mapro.Roach and Sons- Panchgani's oldest bakery and Kerala Bakery at Wai are known for their yummy cakes and pastries. Your shopping is not complete without buying strawberries found in Panchgani. There are no gourmet restaurants in Panchgani but there are abundant street food and the very best rose ice-cream to be found anywhere. Enjoy appetizers like patties, keema pao, and pao bhaji along with piping hot tea. Any how there are few hotels mentioned in the nearby town. Pune is a popular railway station for tourists to Panchgani at a distance of 98 km from Panchgani. Though the railway station nearest to happens to be at Wathar. Panchgani is well linked with Mumbai and Pune through road.